Throughout the 11-team Hockey East Association, 10 different goalies have played the bulk of the minutes in net for their respective teams. Each one has secured the starting job and has been entrusted with playing most, if not all, of the remaining games on the schedule. With about one month remaining in the regular season, the Massachusetts hockey team is still waiting for one of their two netminders to take over the crease for good. The Minutemen, losers of four straight, lost twice to Maine Jan. 26 and 27, with freshman Matt Murray and sophomore Ryan Wischow each sharing the UMass cage. Both netminders surrendered three goals in losing efforts, with Wischow seeing slightly more action making 23 saves compared to Murray’s 21, thus continuing the search for UMass’ go-to-guy in the net. Back in late November, Wischow was one of the hottest goalies in the Hockey East as the Green Bay native won four consecutive starts, beating Providence and Connecticut and sweeping Quinnipiac, ushering the Minutemen to their best stretch of the season. Now in desperate need of a goalie to take the torch, Wischow feels the responsibility of rediscovering his game for UMass. Sporting a .898 save percentage, a 3.03 goals-against average and a 7-5-0 record, Wischow has the better stats among the Minutemen puck-stoppers. Goal-scoring hasn’t exactly been a strong suit for UMass during this slide, and both Carvel and Wischow admitted getting suitable goal support will further help the play on the other end of the ice. “It’d be nice if our guys scored three or more goals for them, which we weren’t able to do,” said Carvel. 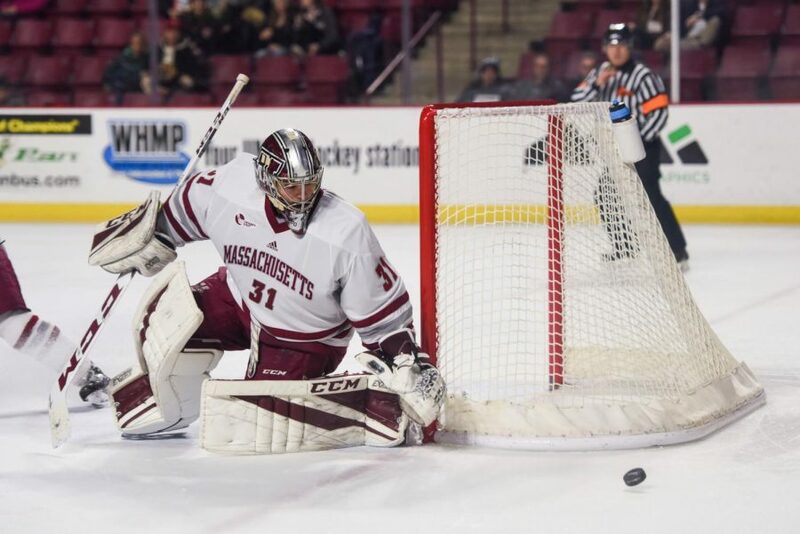 About to enter the most important set of games in its schedule, UMass will need its goaltending play to step up, regardless of who is in between the pipes.